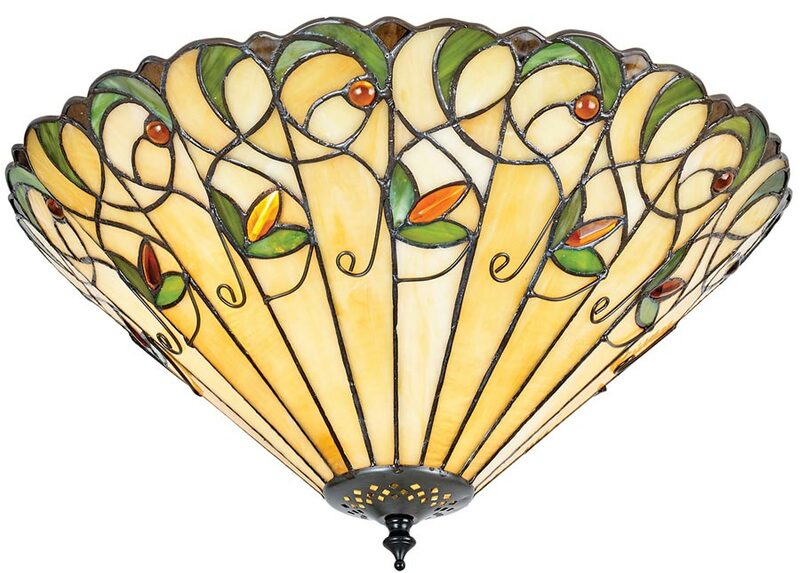 The Jamelia large 3 lamp Art Nouveau style flush Tiffany light features an intricate design in subtle colours and amber glass beads, teamed with highlighted bronze finish fittings. Perfect for any room with a lower ceiling. This Jamelia large flush Tiffany light is a sophisticated Art Nouveau design, with glass teardrop jewels forming the rosebud design. Beautiful scalloped emerald edging with a warm natural contrast cream base. Attached to a concealed flush mount by a lower finial. This is a hand-crafted Tiffany shade flush light and the colours may differ slightly from the image shown, as each piece of glass is hand-made and may differ slightly in colour or shade. This should not be seen as a fault, rather something that makes each Tiffany shade unique. The Jamelia large 3 lamp Art Nouveau style flush Tiffany light, designed and manufactured by Interiors 1900.